The Budapest Business Journal – Book of Lists 2018/2019 is an industry guide unique to Hungary and provides company data of 2,500 of the largest companies in more than 70 fields. 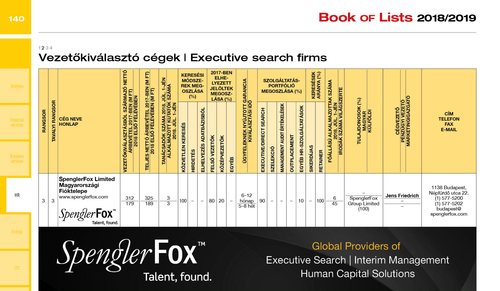 We are pleased to share that SpenglerFox ranked 3rd amongst Executive Search firms in Hungary. I am delighted once again by this recognition of our services to the Hungarian market. Since our Budapest office first opened in 2005 we have been continuously identifying the very best senior executive talent for our clients businesses. As we now enter the second year of our MBO in 2017 our team in Budapest is continuing to grow and our Research team strengthened to further support our client and candidates as they evolve.